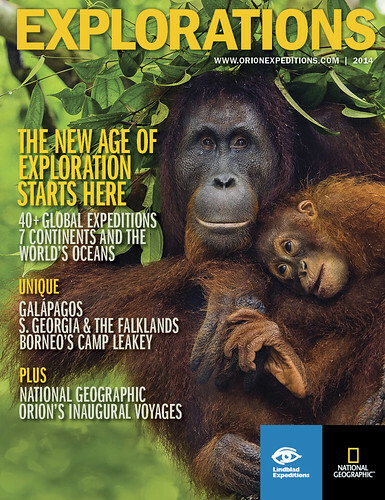 Lindblad Expeditions-National Geographic is launching their new 120-page catalogue highlighting their expedition itineraries sailing in 2014. With a fleet of 10 expedition-style ships, they will visit all 7 continents and offer over 40 unique and diverse itineraries ranging from seven to twenty-four nights. Highlights include Arctic Norway, Iceland, Greenland, Antarctica, Kimberley Coast, Panama & Costa Rica, Galapagos, Northwest Passage, Borneo, Alaska, the upper reaches of the Amazon River, Tahiti, Easter Island and much more. Whether exploring the Amazon River or holding hands with an infant orang-utan in Borneo, information about these life-enhancing adventures are revealed inside Explorations - the first step towards discovering the most authentic, immersive and engaging travel experiences on earth. Together Lindblad Expeditions and National Geographic offer travellers unique opportunities: an experienced expedition team sharing their knowledge and enhancing your understanding, plus National Geographic explorers, writers and photographers; a fleet of expedition ships ranging in size from 28 to 148 guests, all well-equipped with a range of tools for exploration including Zodiacs, kayaks, hydrophones, video equipment including an ROV (on NG Orion and NG Explorer), scuba equipment (on NG Orion) and snorkelling gear. Lindblad Expeditions‐National Geographic, pioneers in expedition travel, offers voyages in the Galápagos, Antarctica, the Arctic, Baja California, Alaska, Costa Rica, Panama, the Amazon, Asia & Pacific, Africa, Europe and beyond. They work in alliance to inspire travellers to explore and care about the planet. Their collaboration in exploration, research, technology and conservation provides extraordinary travel experiences and disseminates geographic knowledge around the globe.